I took this photo near Gabriel Fauré middle school. 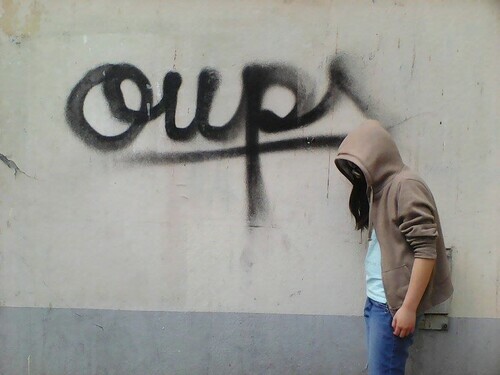 We can see the word « oups ». I chose this tag because it’s very simple and I’m clumsy. I’m on the right of this photo and I’m wearing a hood. Tags should be more present in the 13th district of Paris. In my opinion, street art isn’t vandalism, I think it’s a way to express ourselves. If graffitis were legal I would also do it.